All boat rentals include adult life vests free of charge. Pontoon is Daylight hours use only. Arkansas State Law all Children 13 and under must wear a Life Vest at all times. We DO NOT SUPPLY children's life vests, you must bring your own. A third guest can go on the river trips for an additional $25.00. Other Lodging and Guided trips available, just tell us what you would like and we will arrange it. Sales tax will be added to all of the above prices. We do not charge for children 1 year and under. We take all major credit cards Visa, Discover and Master card. PETS ALLOWED ON A CASE BY CASE BASIS (Please call ahead of time.....please do not assume your pet is OK)....MUST BE KEPT ON A LEASH....AND ARE NOT ALLOWED IN THE POOL AREA---PETS ARE NOT TO BE LEFT IN CABINS ALONE. -You will be responsible for all damage by any pets----- A $7 A DAY CHARGE PER PET WILL APPLY. 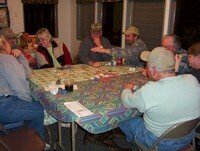 A $100 deposit per cabin is required to hold a cabin for a stay of 2 nights or more. If no deposit is received within 10 days after a reservation is made, the reservation will be canceled. Once we reserve a cabin, it is removed from the market. Balance on all days reserved is due upon arrival. No refunds for early departures. No Shows will be charged full amount for days reserved. Our reservation policy is intended to be fair and yet to prevent loss of income to our business. Since our location is such that we do not have a large volume of traffic past our office, we must depend heavily on advance reservation business. If a Reservation is canceled earlier than 30 days prior to the scheduled arrival date, we will refund the deposit less a $20 handling fee per cabin. Reservations canceled less than 30 days prior to arrival will be refunded only if we can fill the reservation completely. All visitors must register at the office and a $7 per day fee may apply. During the off-season, when our snowbirds are visiting, we will fire up the fireplace in our recreation room, and have a nice potluck or snack night. 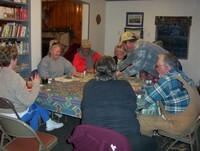 Everyone enjoys playing table games and of course the important part....tell tall tales and have lots of fun. There is a local community center just down the road that has monthly dinners with bingo and a monthly country breakfast too. Bringing a boat? I will show you around out on the lake the best I can so you may become familiar with the area. Come join us.....we have lots of fun!